Very interesting article. But, Amanitas , the red and white variety often grow under Birch trees in the U.K. and these are not evergreen. The article didn't say they ONLY grow under evergreens. Hey Dennis, that is a good point. It seems that the connection between Santa and Satan comes later in the story, just as all the other Christian elements of the holiday are recreated from these earlier Siberian practices and traditions. That's how I would see it. Perhaps this is related to the tendency to demonize any non-Christian religion, which is how shamanism was historically viewed: as evil work of the devil. Direct experience however makes this claim nonsensical! Krampus is the dark side of Santa. One cavil - virginity is generally only important in religions that worship sperm and penises. It's only purpose, outside of ritualistic 'innocence' is to reserve ownership of children under the authority of sperm donation. 'Virgin' birth is generally a male conceit. For any being to be born, a portal must open. Santa is the Sanskrit word for peace. The Santoor is an instrument for evoking peace. Satan does not exist as nothing can defy the will of God. Haven't you heard of Bill Hix? like Dennis is sinned backwards? Important material to teach to the children. The layers of this traditional party are manyfold, and each layer plays a particular role. I don't only love the tradition of Christmas, but I am also a Christian. Now the Christmas party differs across the world. Local traditions are added all the time, which is fine. He teaches us to love God, and every other human being as much as yourself. That's it. Sounds simple? It is. Even more so in current spiritual context: Respect nature or mother earth and care for every other person as much as you care for yourself. So raise yourself to happiness. The happier you are, the happier every other person can be. If you lift yourself to happiness beyond your own imagination and beyond your own life, just think about what that would mean for others. He did it. You can do that too. Sorry if you're Christian you're wrong. Very interesting, Matt :) Thanks for sharing. Please send future articles to me. Will do, thanks for reading. Yes, very interesting. I did also come across some similar info connected to other European traditions! I enjoyed your version. Pls continue to post ancient spiritual healing practices and send me the newsletter via email. Really enjoyed that . Like joining dots. Makes so much sense .. Yes, these are the Sami people. I know there are cultural variations in different groups throughout the region, but these elements are pretty common region-wide. Fascinating story with obvious elements of truth, many of which date back over 2500 years. Of course when speaking of the North Pole it is probably just North of the Arctic Circle that is meant; the North polar ice cap is not on land and so cannot support trees or mushrooms. Yes of course. We are talking about the subarctic and other northern regions. The North Pole, only in name as it relates to the cultural significance of Christmas. Hi Peggy - thank you. If you would like to be on the email list, just send me an email with the address you would like included. This was a pleasure to read. I'm very *uninterested* in many of the traditions of Christmas this year (not into humbug but close), but this article revived me. The tree, the transformation, the light, the reindeer and the mushrooms. All of it is moving and sacred space. As a point of discussion, I would say that we are predisposed to experience something dark, like a weakening of the outer self, along with a falling toward internalization and contemplation as the season darkens. Any return of light still affects us deeply. Shopping and eating non-stop don't fit this, but these other outdoor/indoor rituals of shamanistic cultures and the science of natural observation are powerful to contemplate. Today the wind is blowing and I feel more connected to the landscape, even though it's bitter out there. I feel allowed to turn inward and grateful. Thanks for posting this. Thank you for sharing this. I resonate with your comments. The technological world makes it seemingly easy to forget the natural movements of the earth - which are our own, internal and external movements of the spirit. It struck me that Amanitas also grow under birch trees... Because in the Celtic tree oracle the 24th of june represents the birch, and it is also the summer solstice. In Christian culture it is also the birthday of John the Baptist, who was half a year older than Christ. I would love to send this to my son, would you please email it to me. Wonderful read! Hi Emmie, sure thing. Just send me an email to matt@shamanicevolution.org and I will send you the link and the text. Donald read this to me last night, and this morning I find it in my in box. Fascinating stuff!! Makes so much more sense than any of the singular stories we've heard in our lives. Fascinating stuff. Loved learning about the true meaning of the Christmas myth. Another idea concerning Jesus Christ and the three wise men, perhaps he was simaler to a reincarnated lama that you find in Tibet perhaps the wise men were searching for the reincarnation of a highly developed being? Bit too many people ready to believe this Fret one read. How did the traditions move across the world? Surely gift giving can't be isolated to one small out let. Though interesting seems very far fethe to me. agenda other than the truth. This article is a complete nonsensical oversimplification. If you deny shamanism, spirits, and all things that SCIENCE proves to be true again and again, you're not an atheist, and seek your own opinions rather than the truth. You're right, part of it anyway is not true. It is well documented that Jesus of Nazareth was not born on December 25th or even in the winter. Roman Catholicism attempted to Christianize their Saturnalia winter solstice celebration involving the rebirth of the Sun. Equating the Sun and Son of God because of the way the two words sound in English, and only English, calls into question the intelligence of the writer. Refreshing and rejuvenating as the materialism that has claimed this season loomed depressing at best. Thank you for your meaningful article. 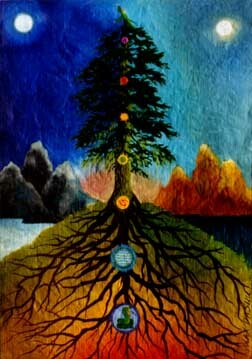 It inspires me to reclaim my responsibility for my reality and consent to the grace that is in the knowing. Word "Tungus" is just an old word for "Evenki", so that "Tungus"="Evenki". So nice to read about research into reclaiming the true origins of our most common holidays. To add to this, take a look at the Odin/Sleipnir ( the eight legged horse, referred to as the dead man's bier) connection, the wild hunt , Yule, etc. Odin is one of the earliest shamanistic ecstatic gods of Europe prior to the great genocide. Thank you for the insight and clear explanation. Thank you, Matt! Loved your article! I have often asked myself those very questions regarding the elements of Christmas and the answers have not resonated with me until now. Thank you for the gift of sharing your research and insight. Great Article! Thanks very much. I'll share it. This is a very interesting article. 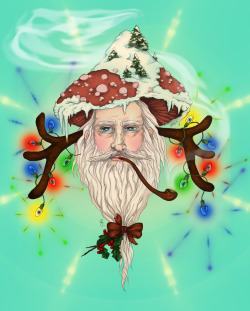 I knew about the reindeer and the flying mushrooms but did not know about the rest. However, there is a point that I would like to bring out. Jesus was not born on December 25, he was born around October 1st or 2nd. If you look at the Jewish calendar you will see that the shepherds would be out of doors round about the October time and not December when the sheep would have all been safely tucked up and warm in their sheds. There are also other reasons for this but I will just post this for now. What happened is that the Catholic Church mixed Paganism with Christianity and that is how Christmas was born in the Churches of Christendom. The Catholic Church as well as other Denominations of the Churches of Christendom have all got a measure of Paganism mixed in with their beliefs and if you have a look at a book called "The Two Babylons" by the Rev Alexander Hislop you will see this very clearly, as this person was both a reverend in the Church of England as well as a qualified Historian. Although he has a go at the Catholic Church he also mentions these things coming into the Church of England. Plus if you do some research on the signs, symbols and beliefs in this book I am sure that you will see some of them in each of the Churches of Christendom and not just the Catholic Church. That's it, I will leave at this for now. Correct, but remember that this is Paganism written for Pagans. These are people who believe that poisoning their brains with mushrooms somehow gives them access to ambiguous spirits that gives them gifts integral for the survival of their primitive tribes yet no real technology or any real knowledge to advance themselves. They don't know God nor do they care about when Jesus was born or that Sun and son only sound alike in English. But they done us the service of exposing Xmas for what it really is. As a Taoist, with Seasonally Associated Depression, for whom Christmas has become quite the challenge, thank you for this generous dose of therapy. Brilliant and gorgeous. Beautiful world, right? Excellent article. Thank you. Sharing on my interfaith ministry blog. Having grown up in a Dutch household and visited my relatives in the homeland i was able to experience the comparison of lifestyles between america and holland first hand. I've enjoyed the year end holidays in both cultures and i have often wondered the connect between the seemingly parallel similar styles of celebration with Snterklaas and Santa Claus. Both are modern myths of course based on a universal truth of some sort for the convenience of a shared common experience within a social construct. It seems in my view, we find a way to best find a way to coalesce a social norm to fit the narrative of our times and place. For me the dutch Sinterklaas to american Santa Claus was best reconciled by the christmas story in the hollywood production of Mircle on 34th Street,1947,20th Century Fox with Natalie Wood and Edmund Gwenn. Both Natalie Wood and Edmund Gwenn spoke dutch in a small yet significant scene as the child star confronted the Kris Kringle as to whether he was the real Santa Claus. Gwenn won an academy award oscar for best supporting actor. The movie was selected for preservation in the U.S.National Film Registry by the library of congress as being,"culturally, historically, or aesthetically significant",2005. And yet, the delightful and wondrous inducing pagan rituals were a kind of puzzle as to how it actually fit into the seasonal christmas narrative. Matt Toussaint's, ShamanicClaus:TheShamanicOrigins ofChristmas,12/24/2013,Reality Sandwich blog, beautifully closes the loop on the nordic narrative. The celebration of christmas as the birth of Jesus of Nazareth and the northern hemisphere winter come together beautifully with its; evergreen trees, reindeers, ornaments, tinsel, presents, drinking spiked spicy aromatic hot toddy and or yellow egg nog, and green & red bunting makes sense. I found the article really interesting, have an issue with the concept 'virgin birth' used, to describe a tribal belief relating to Fly Argaric and host tree. Inadvertently, the beliefs from our own culture are imposed on theirs. The understanding of the relationship might be more aligned with the idea that within, there is both male and female in perfect balance...I don't know either, but I understand we use our own cultural references in order to explain, and in so doing, make this 'Other' part of our own. Many thanks for the article. A seventh generation ancestor of mine spent seven years living with the Evenk as told in the Lost Letters of Gerhard David Epp. Neither he nor I knew of what you write, but there are close similarities. I was quite interested until they threw Jesus into the mix. If Jesus was indeed real, he was not born in December but March when the shepherds would have been in the fields with the sheep who were also lambing. Sin duda el origen de muchos ritos actuales datan de pueblos ancestrales, el problema fue cuando lo tomaron como suyo los yankis e hicieron una historia de la coca cola y del sistema capitalista. Consume, materialmente. P.S.- I'd like to submit this article to Medium.com with your permission. Medium is a writers blog/website sponsered by the Bill & Melinda Gates foundation but remain editorially independent. Check it out and let me know if you are good with that. Thank you for your suggestions Mark. I will check this out for next year. If you would like to submit this to medium.com, I am definitely good with that. Thank you very much for your support! The Santa Claus story was intended to cause problems among Gentiles who were Christians. The Santa story’s main purpose was to undermine Christianity." First; A pastor of a congregation of christians understand the significance of the allegorical myth of Santa Claus; To convey basic truths of human-nature related to empathy, compassion, wonder, hope, and giving - all of which in the most recent research studies of the life-sciences,[neuro-science and cognitive-science] are necessary constructs for human development in mental health. Second; The myth of SantaClaus is an American cultural appropriation of the the Dutch myth of Sinterklaas from colonial times as part of the historical narrative. The American culture in general is the out-growth of cultural appropriation of many cultures which become part of the myth through assimilation of overlapping traditions. The original Dutch american settlers were called "Yankees" as compared to the original British american settlers were called "Limeys". Yankees has come to mean americans in general globally and yet it means inhabitants northeastern/ NewEngland in america in particular. In Australia which was founded by the Dutch,1606, the term "Yank" is said with a certain fondness for things american. Even the language of English is a dialect of Dutch,[a.k.a.,Old-english] spoken in the Dutch northeastern provinces,[a.k.a.Frisian]. The English were Anglo-saxon immigrants to Britannia having migrated through Hollandia,mainland europe,[c.e.,Fifth-century]. Third; The myth of Sinterklaas is based on the legend of Saint Nicholas, a Turkish born gift-giver and patron-saint of children. In the years c.e.,312-315, Nicholas lived there as a pilgrim to visit shrines in the Holy Land. A text written in his own hand is still in the care of the Greek Orthodox Patriarch of Jerusalem. It was in his prayers that Nicholas heard the Holy Spirit call him back to Asia Minor,[Myra,Turkey], where soon after his return in c.e.,317 he was consecrated bishop. In c.e.,325, he was one of many bishops to answer the request by the Roman Emperor Constantine to develop christian doctrine at the First Council, Nicaea. There, Nicholas one of the bishops who signed the Nicene Creed,[c.e.,Fourth-century]. Fourth; Jesus of Nazareth is a matter historical record based upon the authorities-having-jurisdiction at the time the Roman-empire. Publius Cornelius-Tacitus, historian and Flavius-Josephus,expert on hebrew-tradition of the court of the Emperor recorded them in ANNALS,HISTORIES, and BOOK-XVIII,c.3;v.3, books of the empire,[c.e.,First-century]. Fifth; U.S.President-Thomas-Jefferson,POTUS-No.3, author of the American Declaration of Independence, read the bible during his administration and rewrote the bible in his retirement to remove the "ignorance and roguery" of men, "The philosophy of the teachings of Jesus of Nazareth",[a.k.a.,the Jefferson-bible,1904,published by the U.S.government printing office,(written c.e.Nineteenth-century, published c.e.,Twentieth-century)]. Other records show even though Jesus of Nazareth had no servants, He was called "Master"; He had no formalised education, He was called, "Teacher"; He had no medicines, He was called,"Healer"; He had no army, yet authorities of their time feared Him; He fought no wars, yet His message covered the globe; He committed no crime, yet He was crucified; He was buried in a tomb, and yet still lives today. Geez,... just saying,... doesn't anyone read anymore. Great article! The artwork is fantastic. Are you also the artist?